Prepare yourself for new teas steeped in creativity. This Houston tradition is now in its 6th year. Houston’s only all-organic tea shop hosts an annual tea blending contest to discover new flavors and unearth Houston’s most creative tea lovers. How can you participate? Come join us to vote for your favorite! You’ll get to try all the competing tea blends, no fee, and vote for the best one. Voting starts at 7pm. Want to compete? Register at 713-252-4473 ($20 entrance fee). Contestants will have from 6pm-7pm to get their tea ready. 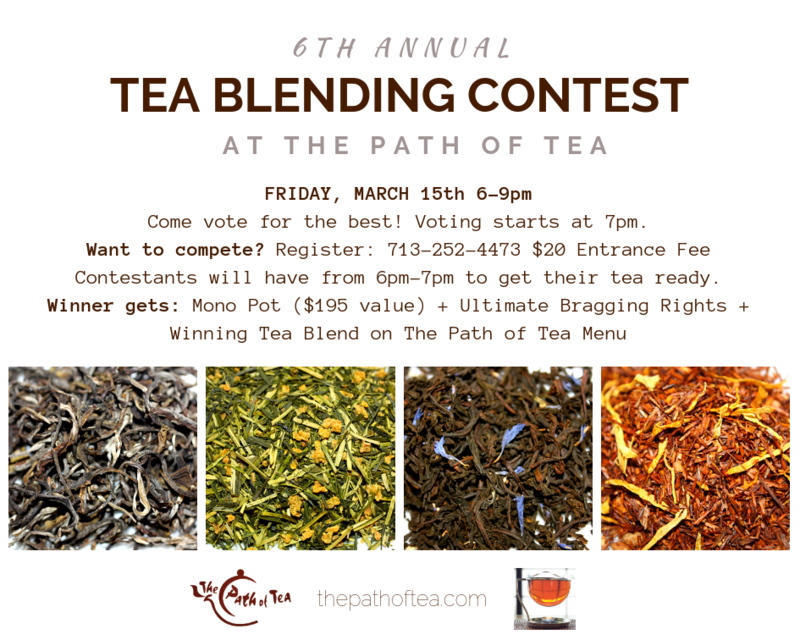 Winner gets: Our Famous Large Mono Tea Pot ($195 value) + Ultimate Bragging Rights + their Winning Tea Blend will be added to The Path of Tea Menu!